March Break is upon us and there’s no shortage of events in the Cornwall area to keep you entertained! Join Ontario Power Generation and the St. Lawrence River Institute during March Break for free programming all week at the St. Lawrence Power Development Visitor Centre in Cornwall. There’s daily activities focusing on wildlife, insects, science and much more. It’s also an opportunity to check out this cool attraction which offers fun interactive games and exhibits that are sure to entertain the whole family! Bring the family to the Cornwall Civic Complex for some exciting Junior A hockey action on Thursday night between the Cornwall Colts and Rockland Nationals. Game time is 7:30 pm and tickets are available at the Civic Complex Box Office prior to the game. Head to the Benson Centre next Saturday for Seedy Saturday, a free, family-friendly event designed to help new and existing gardeners find the seeds, tools, and tricks they need to succeed at home! Take in some live theatre with Vagabond Theatre’s presentation of Dilemmas with Dinner at St. John’s Presbyterian Church. Show dates include March 10th, 15th and 16th. Enjoy classical organ music in a divine setting with Nativité Recitals. The performance will be held on Sunday, March 17 at 2:30 pm at Nativité Co-Cathedral (220 Montreal Road) featuring the talented Yulia Draginda, an international concert, organist, pianist and chamber music partner. Prepare to be amazed! Escape winter by taking in some beautiful art exhibits in Downtown Cornwall. Enjoy ‘Blossom & Bloom’ by Cynthia Gatien at Cline House Gallery (open Wednesday to Saturday, 11 am to 4 pm) or check out the Carriere photography exhibit at Cailuan Gallery (open Thursday 11 am to 7 pm, Friday and Saturday 11 am to 5 pm). Let your young artist put their skills to the test with an Art Attack session by Whimsical Memories at Cailuan Gallery. Sculpt a paper mache bunny or take in a paint workshop! Looking for a fun way to unwind? Or a girls night out? Come down to Truffles Burger Bar on Sunday, March 10th from 1:30 pm to 3:30pm to create and socialize over some lunch during a Paint Nite event! Catch some big air over the March Break at Big Ben Ski Centre! The centre will be open daily from 10 am to 4 pm during March Break. Embark on a family adventure or go solo for an outing on the beautiful snowshoeing and cross-country skiing trails at Guindon Park. Open from 8 am to 11 pm every day, Guindon Park is the perfect place to experience the beauty of nature in the wintertime! Get outdoors at Summerstown Trails! Take advantage of a special March Break deal – ski rentals are $24 and snowshoes are $12 for the week. Pick-up equipment at the trailhead on Sunday, March 10 before 4pm and drop off the following Saturday! Visit the Upper Canada Migratory Bird Sanctuary over March Break for daily activities from March 9th to 17th from 12 pm to 4pm! From ski and snowshoe rentals, a photo scavenger hunt and a wildlife photography workshop, there will be lots to see and do. Check out one of the City’s outdoor rinks (weather permitting) for some old-fashion fun. Optimist Park is a good place to start – the Optimist clubhouse is open on Fridays, Saturdays and Sundays serving up sweet treats including their famous Moose Ears! For more info, please click here. Take the plunge at the Cornwall Aquatic Centre or skate the day away at the Benson Centre! There’s a variety of swim and skate sessions taking place throughout the week. There’s also fun classes and activities taking place at the Benson Centre all week long. How about sliding the day away with some tobogganing? 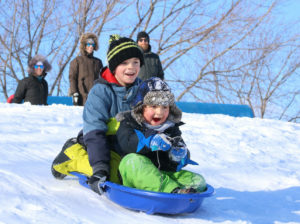 The hill in Lamoureux Park and the eastern entrance to the Long Sault Parkway are two popular spots to slide the day away (weather permitting). Check out fun and engaging daily activities offered by the Cornwall Public Library all week long! Activities include chess camp, children’s yoga session and a St. Patrick’s Day craft station. Escape to a world of fun at Rush Hour Escapes! Two challenging escape rooms will test your group as you work together to find clues, crack codes and solve puzzles to escape before time runs out! Book your visit today online by clicking here. Looking for some indoor fun? Have a friendly battle in this challenging laser tag centre and try out the virtual reality stations for an out-of-this-world experience! Enjoy some live entertainment with Eagles tribute One of these Nights at the Port Theatre. The popular act will be playing two shows, on March 15th and 16th! Celebrate St.Patrick’s Day on Saturday, March 16th at Schnitzel’s in Downtown Cornwall. Local favourites The Shiners will be bringing down the house all night long!